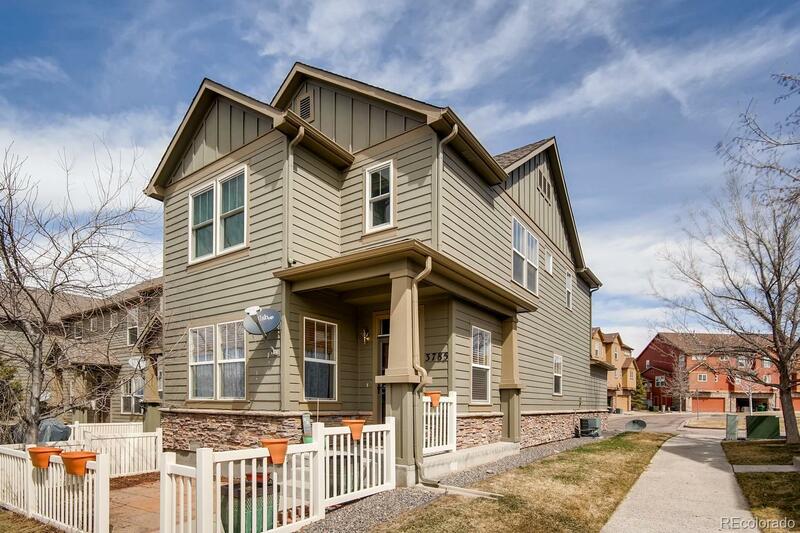 Choice townhome end unit with mountain view offers low-maintenance living in convenient location. Lustrous hardwoods extend through living & dining rooms. Jumbo wall cutout opens sightlines between living & dining, and bathes dining room in natural light. Living room has ceiling fan. Kitchen has great work triangle with peninsula counter. Master suite has ceiling fan and private 5-piece bath. Secondary bedrooms are serviced by 2nd full bath. 3rd bedroom has hardwood floor. It’s move-in ready with appliances included. In-unit laundry. Recent updates include new whole house fan and new upstairs west side Andersen windows. Pet-free and smoke free. Courtyard has room to grill. Attached 2-car garage. HOA takes care of exterior maintenance w/ roof, trash & recycling and snow removal. Walk/bike to HS/MS, The Grange community center & pool, recreation & dog park. Minutes to highway & mall. Enjoy a thriving community without dealing with home maintenance chores! Don't miss out - MUST SEE!